Last spring, Nikki Beckett vanished, sucked into an underworld known as the Everneath, where immortals Feed on the emotions of despairing humans. Now she's returned - to her old life, her family, her friends - before being banished back to the underworld... this time forever. She has six months before the Everneath comes to claim her, six months for goodbyes she can't find the words for, six months to find redemption, if it exists. Nikki longs to spend these months reconnecting with her boyfriend, Jack, the one person she loves more than anything. But there's a problem: Cole, the smoldering immortal who first enticed her to the Everneath, has followed Nikki to the mortal world. And he'll do whatever it takes to bring her back - this time as his queen. I haven't read very much mythology, although it's something that is on my "you really need to read more of this soon" list. 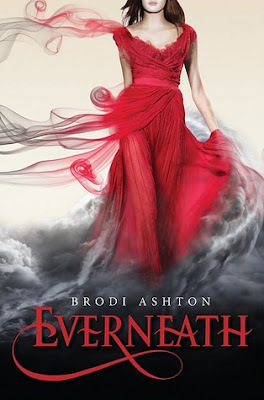 I was intrigued by Everneath because it's a modernized re-working of the stories of Hades & Persephone and Orpheus & Eurydice. In this version, Nikki Beckett is sucked into the Everneath (aka Hades) as a forfeit for Cole. She spends a century being drained of her emotion, her being, to help him survive. This usually leaves the human a shell of who they once were, but Nicki survives and returns home. It's been only six months since she disappeared from the real world, and now she only has six months to say goodbye. The book alternates between the present-day Nikki and Nikki before she went into the Everneath. It adds a mysterious quality to the book because you don't find out right away why she felt hopeless enough to want to be unable to feel. This is one of the those books where the alternating past and present tense got kind of confusing. I was having a hard time paying attention to the timeline. One of my annoyances with this book was that you're thrown into this unfamiliar world almost immediately. Without any real knowledge of the myth, a lot of the terms didn't make sense to me at first. I mean, yes, you start to pick up on things pretty quickly... but I still felt kind of confused in the first few chapters. Also, Nicki spends most of her of six months just doing normal things. Not that I expected her to do anything really drastic, but if you only had six months to left to live you'd think that she would use her time a little more wisely. I finished Everneath almost two weeks ago and am just now writing the review. Why? I just had such mixed feelings about it. I really enjoyed certain aspects (the writing), but wasn't as impressed with other parts (the heroine). Don't get me wrong, Nicki wasn't bad or poorly written. I just didn't really like her. And since the mythology aspect was a little odd, I think having a more enjoyable heroine would have deepened my appreciation for this book. I think she was lacking that oomph a heroine needs. Also, there were a lot of loose ends in this book. Things weren't completely explained, which may be attributed to the fact that this is a trilogy, or they may be things that never get resolved. And I'm just not sure if I'll be continuing on with this series. If you love paranormal YA, then you'll probably really like this book. As for me, it was only just okay. "I'd like you to ask yourself, Who loses hope first? And who never gives up? Because it's not the supernatural abilities that set mythical characters apart. [...] It's the decisions the human characters make, in impossible situations, that have us still talking about them centuries later. Heroes are made by the paths they choose, not the powers they are graced with." Even though this wasn't a favorite book for you, I am more interested in it now. From the other reviews I've read I could tell it had the Persephone myth in it, but I didn't realize that it had Orpheus/Eurydice too. I'm kind of a mythology nerd, and that is my favorite myth, so I think I'm going to have to look into this one. I was surprised when I noticed that very few reviews mentioned the connection to Orpheus and Eurydice. It seemed more connected to that myth, in my opinion, than Persephone. If you're a mythology nerd, then you'll probably LOVE this :) I wish I knew more about mythology. I think that would have made me appreciate this book more, and I probably wouldn't have felt as confused at times. I'm glad you want to read it! If I don't love a book, I always hope that I review it in a way that won't turn people off from reading it if it sounds like something they'd enjoy. I've had mixed feelings about this book since I saw it on Goodreads last year. A lot of people like it, but I've read negative reviews, too, and I was just... confused. It's good to see a review that's kind of... in-between. But I do love mythology, so I think I'll check this one out! Yes, I definitely think I had mixed feelings about this book. I didn't hate it by any means, but I also wasn't absolutely in love with it. If you like mythology, I definitely you should at least grab it from the library to see what you think. You may connect with it more because you love mythology!